Aerospace materials like aluminum and carbon fiber have increasingly found homes on automotive bodies, and so collision might want to keep an eye on a material recently hyped by Boeing. Described in a Boeing video feature last week, the microlattice technology appears similar to carbon-fiber-reinforced polymer (a formal name for carbon fiber) — except there’s no resin. 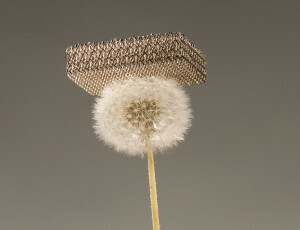 Microlattice, according to Boeing, is 99.9 percent “air” — which implies a balloon but really just means an open crosshatch structure — and can balance on a dandelion which has reached the tufty seed-spreading stage. “Strength and record-breaking lightness make it a potential metal for future airplanes and vehicles,” Boeing says in in a caption accompanying its video blog post Oct. 6. It was actually first shown off in 2011 by co-developer HRL Laboratories, an R&D partner of Boeing. An Oct. 5 HRL news release — which probably prompted the Boeing announcement — indicates the metal would be covered with carbon-fiber “facesheets” and used in next-generation spacecraft. HRL architected materials research scientist Sophia Yang in the video compares the technology to human bones, strong enough to support a 200-pound human but internally hollow — just a spiderweb of thin trebeculae filled with marrow. Compression “in terms of energy absorption” and lightness — Yang can be seen blowing it off her hand in HRL and Boeing video — are among main benefits of the technology, she says. “One of the main applications that we’ve been looking into is structural components for aerospace,” Yang says in the Boeing video. She says floor panels, luggage bins and sidewall panels could be home for the metal. “In the future, the material could help Boeing to save a lot of weight, make the airplanes more fuel-efficient,” she says.